"Rodeo Nebraska" by Mark Harris, associate director of the University of Nebraska State Museum. Recent books published by the campus community include Mark Harris' "Rodeo Nebraska," a large-format photography book that examines the sport, people who attend and communities that host rodeos. Also featured in this column is Mark Hinchman's "Portrait of an Island" and Kelly Kingsbury Brunetto's "Performing the Art of Language Learning." • Rodeo Nebraska, by Mark Harris, associate director of the University of Nebraska State Museum, (Nebraska State Historical Society, 2015, 240 pages) — This large-format photography book is the culmination of eight years of shooting photos at rodeos across Nebraska. Harris visited 82 rodeos in 62 locations, taking photos of the competition, the people who attended the events and the communities that hosted them. • Performing the Art of Language Learning: Deepening the Language Learning Experience through Theatre and Drama, by Kelly Kingsbury Brunetto, assistant professor of practice in modern languages and literatures, (Deep University Press, 2015, 292 pages) — "Performing the Art of Language and Learning" is a narrative nonfiction that reveals college students' experiences of participating in foreign language plays, telling their stories in their own words. This volume gathers the stories of eight undergraduates across range of backgrounds, from complete novices to seasoned performers, and relates their experiences of auditioning, rehearsing, designing, performing and working backstage in theatre productions put on as part of their college Spanish and French courses. The students describe how rehearsing and performing in a second language helped them move from intimidation about their proficiency to confidence rooted in the strength of the group's social bonds. They report how finding creative solutions to production challenges helped deepen their learning and drive their progress. Additionally, Kingsbury Brunetto examines how theatre infuses carnivalesque elements into the learning environment: disruption of hierarchy, a greater focus on embodiment, humor, and playfulness, and the use of costumes and disguises. The students express how this more relaxed atmosphere allowed them to lower inhibitions and enter more fully into their roles. 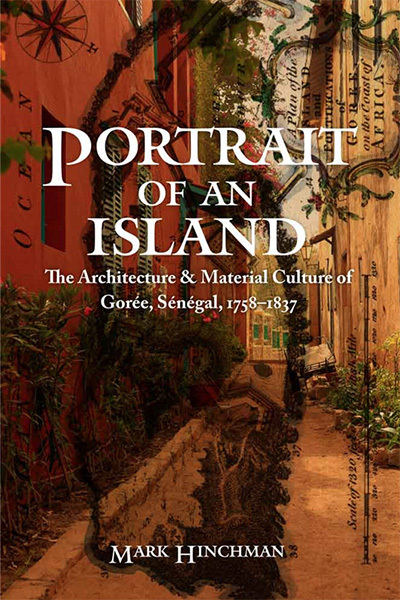 • Portrait of an Island: The Architecture and Material Culture of Gorée, Sénégal, 1758-1837, by Mark Hinchman, professor of interior design (University of Nebraska Press, 2015, 420 pages) — The once-famous trading center of Gorée, Sénégal, today lies in the busy harbor of the modern city of Dakar. From its beginnings as a modest outpost, Gorée became one of the intersections linking African trading routes to the European Atlantic trade. Trading parties brought with them gold, firewood, mirrors, books, and more. They built houses of various forms, using American lumber, French roof tiles, freshly cut straw, and pulverized seashells, and furnished them in a fashion as cosmopolitan as the city itself. A work of architectural history, "Portrait of an Island" explores the material culture and social relations of West Africa in the 18th and 19th centuries. Hinchman's book is an examination of the built and natural landscape that deciphers the material culture involved in the ever-changing relationships among male, female, rich, poor, free and slave. This regular UNL Today column publishes information about the recent publications of UNL faculty, staff and students. For more information about each publication, click the link within the related book. The campus community can submit recent publications news to tfedderson@unl.edu or call 402-472-8515. "Performing the Art of Language Learning: Deepening the Language Learning Experience through Theatre and Drama" by Kelly Kingsbury Brunetto, assistant professor of practice in modern languages and literatures. Portrait of an Island: The Architecture and Material Culture of Gorée, Sénégal, 1758-1837" by Mark Hinchman, professor of interior design.